Are these wardrobes made of timber? 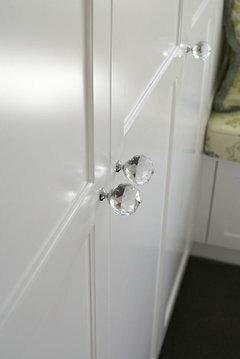 - I would like a shallow kitchen pantry in v-joint style, but my kitchen man says it would have to be polyurethane. Couldn't a carpenter just build one in timber? By the look of the Dan website there is very little they couldn't do. I know money can buy most things but it can't buy style and every kitchen is amazing...great work! John you are much too kind with your praise, but thanks for the comment. Having a second look at the pantries and island, they are built more like pieces of freestanding furniture than built in cabinetry which use different construction methods. I'd say they've deliberately made the frames for the pantry and island out of solid timber for strength, making the frame from mrmdf would be questionable. mecullis, I've spoken to our head cabinet maker through the factory door and he says a pantry like the one shown is within our capabilities. The only spanner in the works would be our policy of only supplying full kitchens (whether detached or not) and I don't feel right in treading on the toes of your kitchen man if you are contracted with him. Hi Sally, it is indeed a federation house. This wardrobe is made from Lamiwood E0 with v-grooving, lacquered in satin polyurethane. It's a simple, yet elegant look. Another alternative for a federation home would be shaker profile door fronts (as seen in many other rooms of this amazing residence). The doors above are push catch and due to their height, are for storage, accessible by a step ladder. Due to the high demand for our work and competition from wardrobe companies I'm sorry to say we find it very hard to service customers who are only after wardrobes. The majority of our work has either been for kitchens or kitchens + other joinery around the home (as was the latter case with this home). Having said all that, you are most welcome to visit our showroom in Sydney to see what we do, it is a wonderful resource for ideas and is staffed by the very designers who worked on this project. 4. 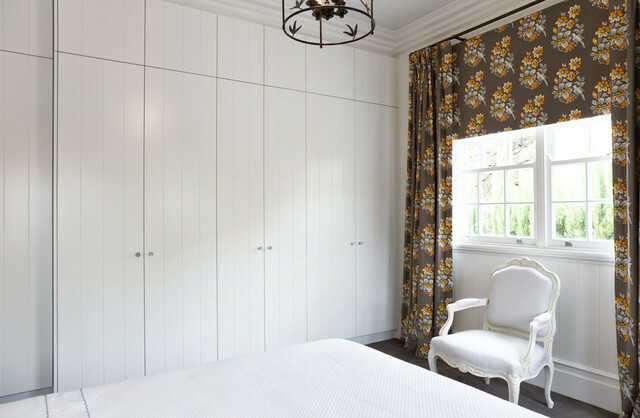 Build a floor-to-ceiling wardrobeIt may seem counterintuitive to build in a floor-to-ceiling wardrobe in a small bedroom but it works wonderfully well. By keeping the lines of the room clean and simple, space is maximised and the flow of the room creates an illusion of space. Nothing makes a room feel smaller than too much free-standing furniture. If you fantasise about watching telly in bed, you can get the TV built into the wardrobe, as seen in this Sydney bedroom.